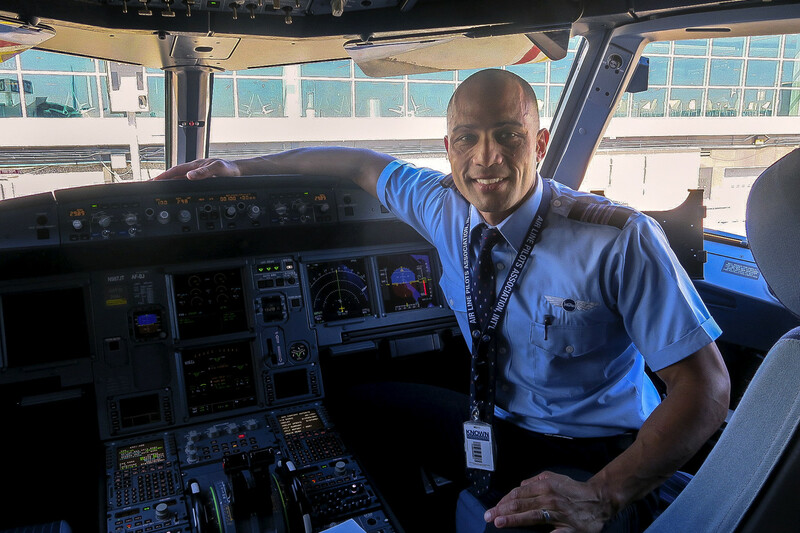 Mr. Chue sits in the cockpit of an A320 aircraft at Boston’s Logan International Airport. He uses a cyclist chat group to discover new trails around the cities he flies to for work. Work travel can take time away from favorite hobbies. But James Chue has figured out how to turn time on the road into more time on his mountain bike. A pilot for JetBlue, Mr. Chue requests specific trips that allow him to use layovers to explore new terrain or compete in enduro races: mountain bike races where only the downhill portion is timed. “Travel can be an easy excuse to fall out of shape,” he says. “I see it as an opportunity to go play.” Mr. Chue, 37, tries to do three-day trips so that he can be home four days with his wife and two children in Kingston, Mass. Most airlines charge a fee to check a bike, but Mr. Chue is exempt from paying $50 each way for his bike with JetBlue. “One perk of being the pilot,” he says. He discovered some of his favorite mountain biking terrain, including Tiger Mountain near Seattle and South Mountain Park in Phoenix, on layovers. He belongs to a cycling chat group on the messaging app Slack and uses it to connect with local mountain bikers—both casual riders and pros—ahead of his trips. “People will pick me up from my hotel and we head to the trails for a few hours or the whole day,” he says. Mr. Chue alternates between bike and weight days. “I lift so I can mountain bike,” he says. “Strength training prevents a lot of injuries.” He says strong legs, core and shoulder muscles are important for mountain biking. “If you flip over the handlebars while flying down a rocky trail, your shoulders will dislocate if they’re weak,” he says. A strong core also helps him maintain good posture and avoid low back pain when sitting in the cockpit. If he can’t access a gym, he works out in his hotel room and does crunches, push-ups and the superman exercise, where he lies on his stomach and alternates lifting his opposite arm and leg to work his lower back. He always travels with resistance bands, even stretching briefly in the cockpit after autopilot is engaged at cruising altitude. On layovers of 18 hours or longer, he hits mountain bike trails. At home, he has five single-track mountain bike trails 5 miles from his home. On weekends he likes to drive to Highland Mountain Bike Park in Northfield, N.H. “You put your bike on a chairlift, so riding here is really just about the down, no climbing,” he says. “I love getting a little crazy and hitting massive jumps.” He has a small gym in his unfinished basement. “Rather than sit on the couch at night, I’ll watch TV and ride my spin bike,” he says. Mr. Chue travels with Mason jars of fresh-cut oats for breakfast. Thai food is his go-to on the road. He orders a ginger chicken stir-fry with brown rice and saves half to eat on the plane. At home, he has scrambled egg whites and avocado slices on top of whole wheat toast along with coffee and a banana for breakfast. Lunch is a turkey sandwich or smoothie made with yogurt, blueberries, banana, avocado and whey protein. Chicken with broccoli and ziti is a family dinner favorite. The children eat pasta, but Mr. Chue and his wife make their portion with spaghetti squash. Post-dinner ice cream motivates him to put in extra miles on the bike. He snacks on Sour Patch Kids when he rides. “I sound like a bike snob, but I like fancy gear,” he says. “I use it so much, I get my money’s worth. If you chintz out, you end up paying the same amount fixing or replacing parts.” His 2019 Specialized S-Works Stumpjumper 29 cost $9,500. He paid $3,000 for his 2017 Specialized Fatboy Comp Carbon, a bike with wider tires. His EVOC bike bag cost $399. He pays $20 a month for his gym membership. At the gym, he listens to modern or early 1990s hip hop, including the Notorious B.I.G., Tupac Shakur and Logic & Marshmello. “I like my cadence to match the tempo of the music, so I put on techno and go into beast mode on the trails,” he says. To fly with a bike or to rent one on the road is the money question, says Jim Potter, owner of Vecchio’s Bicicletteria in Boulder, Colo. The destination often dictates the decision. A good bike case can cost $300 or more. “That’s not a terrible amount if you’ve already spent $4,000 on your bike,” he says. There are two major styles. Soft cases roll up when the bike is removed. Hard, plastic cases are more protective but, he says, can be fairly bulky and hard to fit in the trunk of a car. Snap pipe insulation tubing, available at most hardware stores, over the frame of the bike for added protection, he says. Don’t let the air out of the tires—that protects the rims of the wheels. Check with your airline about baggage fees, which typically range from $75 to $200. Some, like Southwest Airlines, count bike bags under a certain size and weight toward the standard carry-on allowance. Thanks for this great story, Wall Street Journal!